This test is done to show the presence of lipids in a substance. The substance is first dissolved in ethanol. This solution is then dissolved in water. If lipids are present in the mixture, it will precipitates and forms an emulsion. Add the food sample to 2 cm3 of ethanol, shake well. Allow to settle in a test tube rack for 2 minutes for food to dissolve in ethanol. 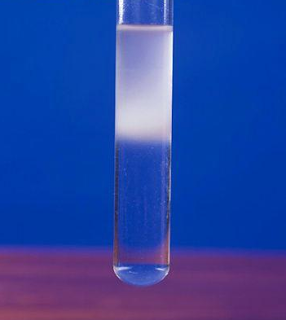 Empty any clear liquid into a test tube containing 2 cm3 of distilled H2O. 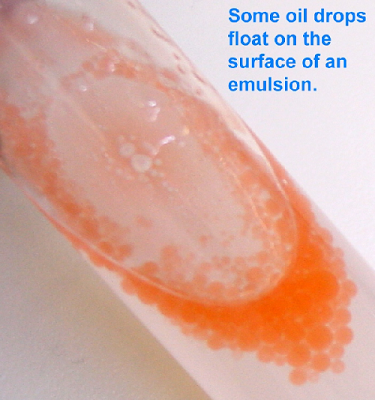 A MILKY-WHITE EMULSION is a positive result: lipid is present. Lipids are insoluble in water and soluble in ethanol (an alcohol). After lipids have been dissolved in ethanol and then added to H2O, they will form tiny dispersed droplets in the water. This is called an emulsion. These droplets scatter light as it passes through the water so it appears white and cloudy.